Imagine a witch needing help to regain her flying powers from a scarecrow and you have this delightful children's story by author Blume J. Rifken. Tally, who is a good witch, lost her power to fly and needs the help of Scarecrow to regain those powers. Scarecrow met Tally at Halloween when she granted him a wish. Tally grants many wishes and forgot that the very thing that gave her happiness could take away her abilities to fly. Unknown to them, Scarecrow has a plan and the story gives the little ones a chance to see a true form of friendship and the rewarding outcome of helping one another. This is a heartwarming story about friendship and teamwork. It is a great read anytime but particularly a good choice during the fall. Both my girls were delighted as I read the story to them and they enjoyed the illustrations by Carl Wenzel. The author, Blume J. Rifken, is a former fashion illustrator and is the author of Silhouettes in America, 1790-1840: A Collector's Guide. 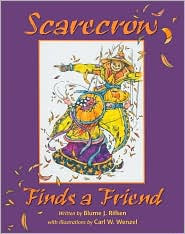 Scarecrow Finds a Friend was her first book inspired by her two grandchildren.